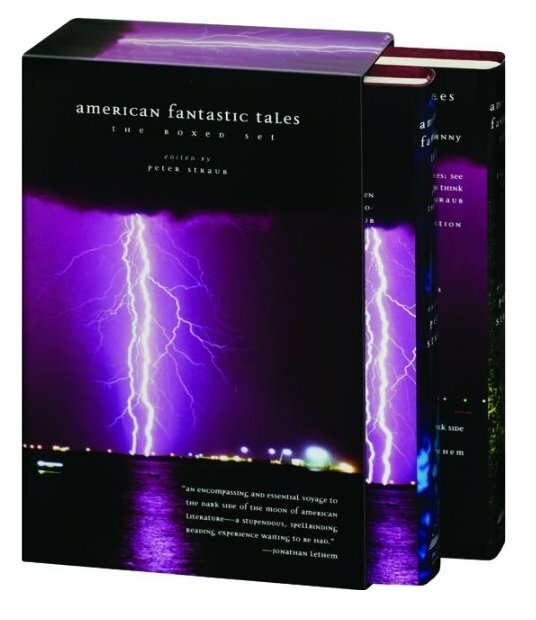 AMERICAN FANTASTIC TALES - 2 VOLUME BOXED SET. 1 of 100 Signed Gatefold Cards by Peter Straub! Produced Exclusively for the Overlook and YOU! Featured Authors: Stephen King, Benjamin Percy, Joe Hill, Poppy Z. Brite, Michael Chabon, Jeff Vandermeer, Thomas Ligotti, Jonathan Carroll, John Crowley, T.E.D. Klein, Richard Matheson, Harlan Ellison, Charles Beaumont, Ray Bradbury, Shirley Jackson, Vladimir Nabokov, Isaac Bashevis Singer, Caitlin Kiernan, Kelly Link, Tim Powers. You can read the complete list of authors and stories below. Almost 1,500 Pages in Two Hardcover Editions. Introduction by Peter Straub for each volume. 1 of 100 Signed Exclusive Cards by Peter Straub. This card also features our exclusive Overlook Connection authorization stamp and limitation number that guarantees authenticity. OVERVIEW: Author Peter Straub has dedicated over 2 years on this project. Mr. Straub is well read in the horror fiction field. He has researched horror fiction from the beginning and has unearthed for us many lost and rare finds. His knowledge of the horror genre is well known, and he has gone above and beyond to find these unique gems in horror. He describes this massive collection as mostly horror, terror, strange, gothic, supernatural, and the unexpected. (no fantasy or science fiction). He also discovered several ghost tales published at the turn of the century by several female writers that were unfamiliar to him, but have now been rescued for this collection. These two volumes also feature original covers by Chip Kidd for this set. AMERICAN FANTASTIC TALES TOTAL: 1451 pages. Volume One: 1805-1939 729 pages. CHARLES BROCKDEN BROWN. Somnambulism: A Fragment (1805). WASHINGTON IRVING. Adventure of the German Student Irving (1824). EDGAR ALLAN POE - Berenice (1835). NATHANIEL HAWTHORNE. Young Goodman Brown (1835). HERMAN MELVILLE. The Tartarus of Maids (1855). FITZ-JAMES O’BRIEN. What Was It? (1859). BRET HARTE. The Legend of Monte del Diablo (1863). HARRIET PRESCOTT SPOFFORD. The Moonstone Mass (1868). W. C. MORROW. His Unconquerable Enemy (1889). CHARLOTTE PERKINS GILMAN. The Yellow Wallpaper (1892). KATE CHOPIN. Ma’ame Pélagie (1893). JOHN KENDRICK BANGS. Thurlow’s Christmas Story (1894). ROBERT W. CHAMBERS. The Repairer of Reputations (1895). RALPH ADAMS CRAM. The Dead Valley (1895). MADELEINE YALE WYNNE. The Little Room (1895). GERTRUDE ATHERTON. The Striding Place (1896). SARAH ORNE JEWETT. In Dark New England Days (1896). EMMA FRANCIS DAWSON. An Itinerant House (1897). STEPHEN CRANE. The Black Dog (1898). MARY WILKINS FREEMAN. Luella Miller (1902). FRANK NORRIS. Grettir at Thornhall-Stead (1903). F. MARION CRAWFORD. For the Blood Is the Life (1905). AMBROSE BIERCE. The Moonlit Road (1907). EDWARD LUCAS WHITE. Lukundoo (1907). OLIVIA HOWARD DUNBAR. The Shell of Sense (1908). HENRY JAMES. The Jolly Corner (1908). ALICE BROWN. Golden Baby (1910). ELLEN GLASGOW. The Shadowy Third (1916). JULIAN HAWTHORNE. The Island of Ghosts (1919). FRANCIS STEVENS [Gertrude Barrows Bennett]. F. SCOTT FITZGERALD. The Curious Case of Benjamin Button (1922). SEABURY QUINN. The Curse of Everard Maundy (1927). STEPHEN VINCENT BENET. The King of the Cats (1929). DAVID H. KELLER. The Jelly-Fish (1929). CONRAD AIKEN. Mr. Arcularis (1931). ROBERT E. HOWARD. The Black Stone (1931). FRANCIS STEVENS [Gertrude Barrows Bennett]. Unseen, Unfeared (1919). HENRY S. WHITEHEAD. Passing of a God (1931). AUGUST DERLETH. The Panelled Room (1933). H.P. LOVECRAFT. The Thing on the Doorstep (1933). CLARK ASHTON SMITH. Genius Loci (1933). ROBERT BLOCH. The Cloak (1939). Volume Two: 1940-2008 744 pages. JOHN COLLIER. Evening Primrose (1940). FRITZ LEIBER. Smoke Ghost (1941). TENNESSEE WILLIAMS. Mysteries of the Joy Rio (1941). JANE RICE. The Refugee (1943). ANTHONY BOUCHER. Mr. Lupescu (1945). JOHN CHEEVER. Torch Song (1947). JACK FINNEY. I’m Scared (1948). SHIRLEY JACKSON. The Daemon Lover (1949). PAUL BOWLES. The Circular Valley (1950). RAY BRADBURY. The April Witch (1952). JEROME BIXBY. It’s a Good Life (1953). Trace (1964). Space by the Tail (1964). CHARLES BEAUMONT. Black Country (1954). VLADIMIR NABOKOV. The Vane Sisters (1959). DAVIS GRUBB. Where the Woodbine Twineth (1964). HARLAN ELLISON. I Have No Mouth And I Must Scream (1967). T.E.D. KLEIN. Events at Poroth Farm (1972). ISAAC BASHEVIS SINGER. Hanka (1974). FRED CHAPPELL. Linneaus Forgets (1977). JONATHAN CARROLL. Mr. Fiddlehead (1989). JOYCE CAROL OATES. Family (1989). THOMAS LIGOTTI. The Last Feast of Harlequin (1990). PETER STRAUB. A Short Guide to the City (1990). KARL EDWARD WAGNER. Cedar Lane (1990). JEFF VANDERMEER. The General Who Is Dead (1996). STEPHEN KING. That Feeling, You Can Only Say What It Is in French (1998). KIT REED. The Mothers of Shark Island (1998). CAITLIN R. KIERNAN. The Long Hall on the Top Floor (1999). GEORGE SAUNDERS. Sea Oak (2000). MICHAEL CHABON. The God of Dark Laughter (2001). JOE HILL. Pop Art (2001). POPPY Z. BRITE. Pansu (2003). STEVEN MILLHAUSER. Dangerous Laughter (2003). M. RICKERT. The Chambered Fruit (2003). BRIAN EVENSON. The Wavering Knife (2004). KELLY LINK. Stone Animals (2004). TIM POWERS. Pat Moore (2004). GENE WOLFE. The Little Stranger (2004). BENJAMIN PERCY. Dial Tone (2007). Hard Covers, Two Volume Boxed Set, 2009 LOA. 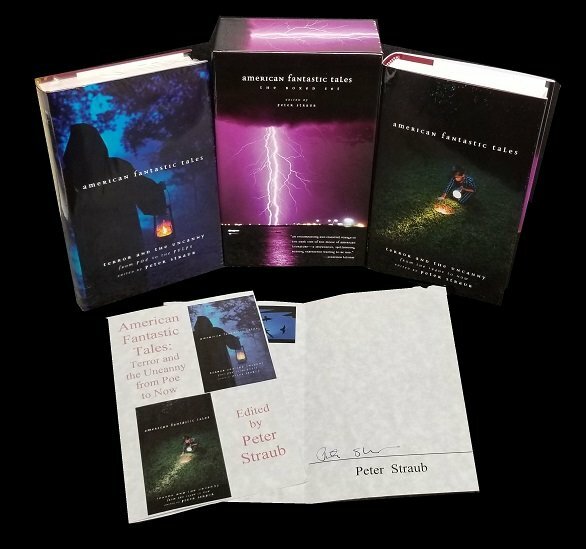 This Box Set also features 1 of 100 Signed Gatefold Cards by Peter Straub!